So it begins: as we head into an election year, politicians and political speakers have already begun priming us for outrage. However, Jean’s doomsaying hasn’t generated quite the reaction he was going for. 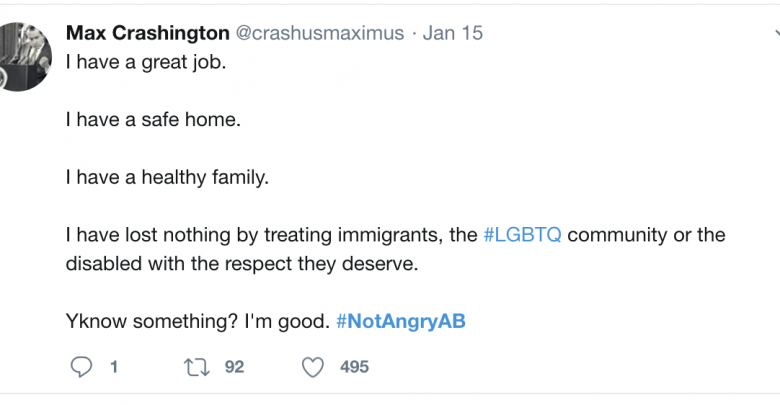 #NotAngryAB, a twitter trend in response to Jean’s message, started that same day. Using the hashtag, Albertans have responded to the negativity with a clear message: we aren’t that angry at all, actually. In fact, we love where we come from, and we’re not huge fans of politicians misrepresenting how we feel to further their own agendas. #NotAngryAB is notable for two reasons: first, it stands as evidence against the “angry Albertan” stereotype. We have, to put it mildly, a bit of a reputation. Often referred to as “the Texas of Canada,” Alberta is widely considered to be a province of intolerance-fuelled conservatism. To much of the country, we’re a bunch of angry, truck-driving rednecks who get off on the scent of petroleum and hate anyone who might be different from us. There is, of course, some truth to these caricatures, but they fail to tell the whole story. #NotAngryAB demonstrates that Albertans care about our province, our country, and each other. Albertans have expressed appreciation for the natural beauty of our parks, the love and support of our local communities, and our ability to make our livelihoods here. In an age of polarization and anger, seeing Albertans from across the province tweeting about what they love about Alberta is a long overdue breath of fresh air. But the second — and far more significant — reason to pay attention to #NotAngryAB is the tone it sets for this coming election year. Jean’s post wasn’t completely inaccurate. Underneath Alberta’s political landscape lies a simmering volcano of resentment. Resentment towards Ottawa, for failing to get pipelines built fast enough; resentment towards the NDP, for controversial moves like the carbon tax and its GSA policy; and resentment towards fellow voters, for having opinions and values that we fail to understand. If there’s one thing political figures love, especially when they aren’t governing, it’s using that resentment. Jean’s post pits Alberta against the rest of our country, calling our relationship with the rest of Canada a “troubled marriage,” as if the rest of Canada is presenting a united front against Alberta we’ll have to fight against. This rhetoric is supposed to make Albertans feel like Canada’s underdogs, severely disadvantaged in the face of great adversity. This is scare tactics, plain and simple. This is the kind of rhetoric designed to build frustration against the rest of Canada until we erupt. Our political conversations cannot be based in a persecution complex if we’re going to get anywhere. Canada is not broken. It’s far from perfect and its problems need attention and care, but to claim that Albertans see our country as a sinking ship from is nothing short of hyperbole. As we listen to politicians make their case about the best course of action for our province, we need to retain a healthy skepticism of everything we hear from them, even if we agree with them. No matter what, we cannot let them put words in our mouths. Christine McManus is a third year psychology, sociology and English student. When she's not writing articles, she likes going to choir rehearsal, drinking way too much tea, and snuggling with her cat, Scotty.